In the early days of the iPhone, I can recall conversations with executives and strategists of other mobile device manufacturers (who shall remain nameless). At the time, I remember how these companies almost discounted the iPhone. We can understand why. Here they are, with many years of experience in the industry, large market shares, etc. And there’s Apple, a nobody, no experience in the market, never built a phone before etc. I’m not sure if these wireless companies were in denial at the time, or whether they really believed Apple and their little toy iPhone was not much of a threat. I got the sense, they really believed it. And I have to admit, I was guilty of a little underestimation of the iPhone’s potential at the time myself – that changed pretty fast for me (see this post, or this, or this). I wonder if now, the tables have turned, and is it now Apple who is underestimating Verizon and Motorola’s new Droid that was announced today? 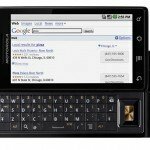 ce so far with Android-based phones, they are a lot more like the pre-iPhone “smartphones” than they are like iPhone – I call them DIY phones. They are more clunky to use, less intuitive, and much less consistent between apps. Apple rules with an iron fist and that has it’s problems, but it also means the user experience is more consistent, even when using third-party apps. However, in the U.S. iPhone has the AT&T Albatross around its neck. Verizon has created the perception that their network is better. Certainly, iPhone users know the AT&T data network is bad, bad, bad (and the voice calling ain’t a whole lot better). Time will tell how this plays out of course, but my advice to Apple is don’t be like those companies you leapfrogged just a few short years ago. Don’t underestimate your opponent.